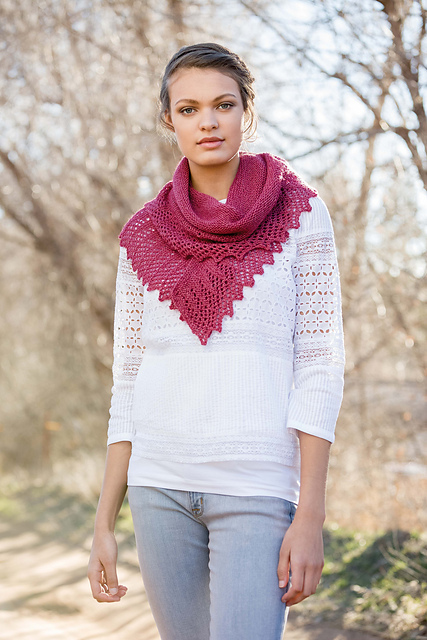 This is my newest design for Interweave Knits, Summer 2015. Preview of Interweave Knits Summer 2015 is uploaded almost two months before season. I spend difficult time to figure it out my internet connection problems and had to delete former posts. Since I got this domain ‘marialeigh.net’, I didn’t write up post much. So,I just lost under 20 posts. 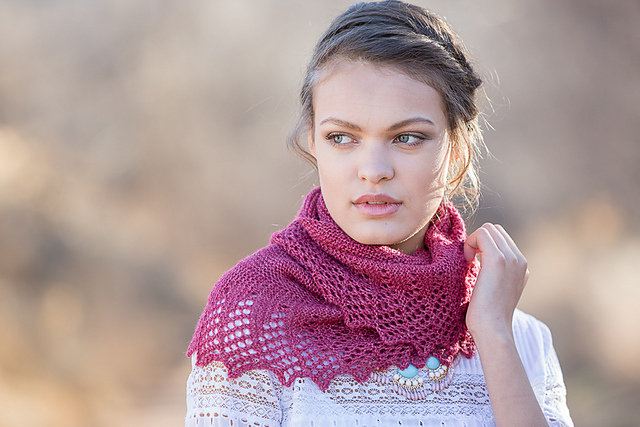 About Larkspur shawl, it’s garter base shawl has crescent shape with simple garter lace edging inspired from wild flowers on the field. It’s top down shawl and it means this shawl has over 300 CO stitch numbers. But, here’s a small tip. Edging has multiple of 10 repeats. If you want to make larger or smaller size shawl, easily add or except multiple of 10 stitch numbers when you start cast on. 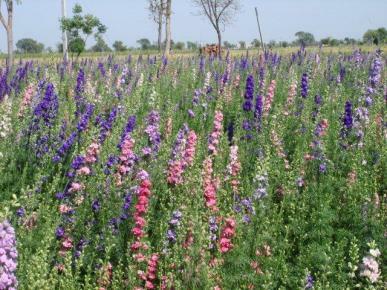 I did image googling for Larkspur. Delphinium is another name of this beautiful flowers. Korean name of this flower has cute meaning. it’s little hood of swallow. 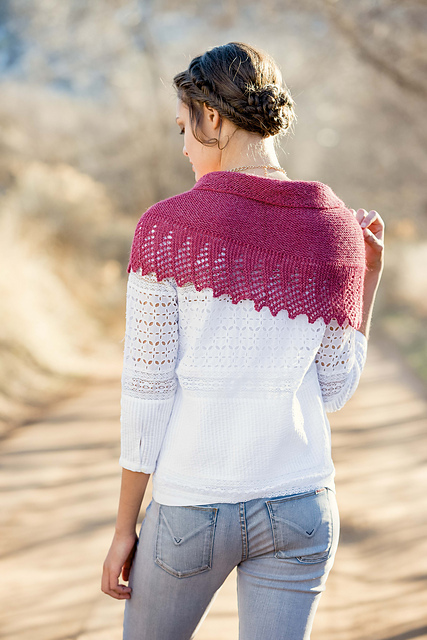 The Larkspur Shawl is a narrow top-down crescent shaped with simple short-rows—no need to hide the wraps in garter stitch. A perpendicular garter lace edging is worked across the bottom. Finished Size 55” wide and 16” deep. Yarn Berroco Folio (65% superfine alpaca, 35% rayon; 219 yd 200 m/1¾ oz 50 g): #4558 cardinal, 3 skeins. Needles Size 5 (3.75 mm): 24” circular (cir). Adjust needle size if necessary to obtain the correct gauge. Gauge 22 sts and 42 rows = 4” in garter st.
Here‘s a Ravelry page of Larkspur Shawl. 이숄은 2015년 인터위브 니츠 여름호에 수록된 저의 최신 디자인입니다. 2015년 인터위브 니츠 여름호는 여름이 시작되기 약 2달전에 이미 프리뷰가 업로드 되었습니다. 인터넷연결하고 글을 작성하는데 문제가 있어 지난 몇개의 포스트를 삭제한 뒤에야 새 글을 올릴수 있게 되었습니다. 이 새로운 도메인 ‘marialeigh.net’을 가지게 된 이후 사실 포스팅을 그리 많이 하지 않아 잃어버린것이 20개 정도임이 다행이랄까요. 락스퍼 숄의 이야기로 돌아가서, 가터스티치가 기본이 되는 심플한 이 숄은 들판의 야생화헤서 영감을 얻은 가터 레이스 에징으로 마무리 되어 있습니다. 탑 다운 이라 자그마치 300이 넘는 수의 시작코를 자랑하지요. 에징은 10의 배수로 되어 있기 때문에 숄의 사이즈를 줄이거나 늘리고 싶다면 10의 배수만큼 늘리거나 줄여 코를 잡으면 됩니다. 락스퍼가 뭘까? 하고 구글링을 해봤는데 델피니움이라고 하는 예쁜 꽃이더군요. 카달로그에서 많이 봤는데 한글로는 참제비 고깔이라는 귀여운 이름을 가지고 있습니다.